Version française : cliquez sur l’onglet en haut de cette page. 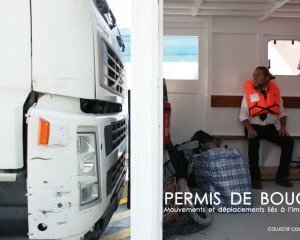 "Permis de bouger" [Permit to Move] – Movements, displacements and travel related to immigration. 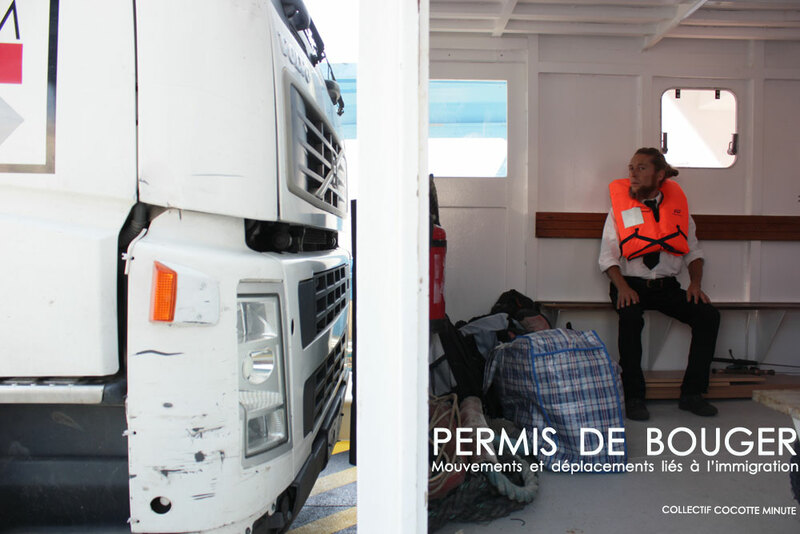 This project proposes work concerning immigration in the widest sense of the word. We do not wish to deal with one particular people. We see immigration as an instinctive thing that drives someone to leave one place to go another. Can we speak of immigration as a straight geometric line or not? We see immigration as an action, a physical, physiological, mechanical, biological, intellectual movement. We want to try to work on what the displacement of an entire life can intimately create in itself and for each person. What circulation of bodies and of minds is possible in an area that is more and more regulated and banalised? Collectively (actors, artists, scenographic designers, theatre directors, builders, video makers and photographers), we experiment with various situations of displacements and movements related to immigration in several public spaces, both natural and urban, whether they or not are suited to these presences. Cocotte Minute is an organisation that creates artistic and cultural projects in public spaces. Starting from the principle that artistic and cultural projects can exist everywhere to meet the public, the collective aims to provide a new viewpoint, to awaken curiosity and to provoke questioning outside of the conventional schemes and places of performance. Transform the place of daily life, displace the artistic act. Ask oneself about reality, the banalised space that we think we know, to propose a different view of it. Cocotte Minute mixes performing arts, scenographic installations and visual arts (fine art, video, photography).